Easy to learn. Easy to read. Easy to use. Based on your input and feedback, Jeppesen is enhancing our IFR charts. These enhancements help increase situational awareness, reduce heads-down time and lower the likelihood of inadvertently violating flight restrictions. Ten enhancements are being made to our charts. Some of the more notable ones include true-to-scale depiction, the addition of terrain, and the distinctive use of color. Human factors testing confirmed the intuitiveness of the enhancements, while a third-party operational risk assessment confirmed no classroom training is required. 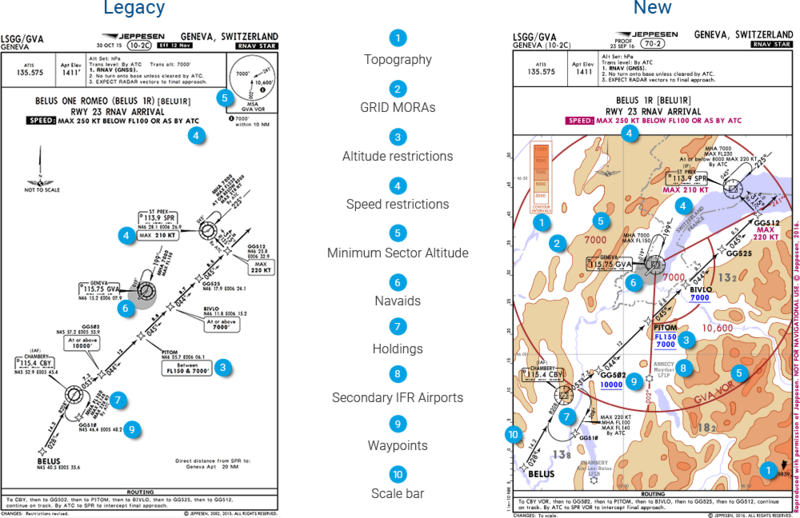 Jeppesen also created Category A self-pilot training to help pilots familiarize themselves with the new enhancements. No separate training sessions means less downtime for your pilots and a lower financial impact to your organization. Everything you and your pilots need to get up to speed on our new chart enhancements is all right here. Download and access the e-learning on your own software/systems. Commercial and business aviation customers alike have told us that depiction of ownship significantly increases their situational awareness at airports. That’s why we just completed georeferencing our entire library of low visibility (10-9B series) airport charts. Starting with the 25 AUG revisions, you will be able to display an ownship spotter for charts on FliteDeck Pro or front panel systems. Jeppesen asked TRS Aviation Consulting, a provider of consulting services in the aviation industry, to perform a Hazard Identification and Risk Assessment to evaluate the potential impact our chart enhancements would have on pilots and flight operations, and what training, if any would be required. Enjoy a detailed look at our new enhancements and how they can help you fly safer, wherever you may fly.